We have earlier read of “those who say about themselves that they are Jews and are not” (2:9; 3:9). Here, we have a group of “one hundred and forty-four thousand,” and the best hypothesis is that these are people who do not say about themselves that they are Jews but are. The “Jews” in the messages to the communities in Smyrna and Philadelphia are not ethnic Jews (2:9; 3:9), and now we have the flip side. Ethnicity is not the main concern, but inclusion in a “tribe of Israel” is. The most interesting features are neither the names nor their order. The “one hundred and forty-four thousand,” twelve tribes times twelve thousand, reverberate with completeness. The history of Israel, in every way marked by disappointment and failure, turned out well after all! God’s purpose in history, even when represented in the history of Israel, came out right. Against a background of apostasy and exile, Revelation presents a picture of faithfulness and return. All the tribes are represented, the good and the bad; the descendants of the concubines count as much as the children of Leah and Rachel; and all of them are there in an equal number even though the census at the time of the exodus show vast differences in terms of numerical strength (Numbers 1:20-46). Not ethnic Jews, perhaps, but it must not be downplayed that the redeemed are represented as Jews, descendants of the children of Jacob. It is as members of Israel all will be saved. There is continuity between Old and New, promise and fulfillment. The continuity is theological and communal. In Revelation 15, the redeemed “sing the Song of Moses, which is also the Song of the Lamb” (15:3). They understand why the song has joint authorship: it is written by Moses and the Lamb (for an explanation, see my chapter on Moses in God of Sense and Traditions of Non-Sense). In Revelation 21, the New Jerusalem has twelve gates, on each gate written “the names of the twelve tribes of the Israelites” (21:12). It also has twelve foundation stones, and on these are “the twelve names of the twelve apostles of the Lamb” (21:14). This is a lesson in theological architecture and construction — whole, seamless, complete, and unbreakable. Theologians in Germany in the first decades of the twentieth century were eager to show that the Old Testament was passé; that it did not pass muster as Scripture for the New Testament community of believers. Count John as a person who disagrees! Count Revelation as a book that refuses to put asunder what God has put together! Count Luther to be on the wrong side on this one for his disparaging attitude toward Revelation! “From every tribe of the people of Israel” (7:4). Home at last! If we look for a parallel in Paul, we find at least one although Revelation’s vision of communal wholeness is worked out in a poetic idiom that surpasses Paul’s, “And in this way all Israel shall be saved” (Romands 11:26). I have put it this way in The Letter to the Romans: Paul among the Ecologists. Paul, more than his opponents, is attuned to the boundaries of the prophetic map of ‘Israel’ in the Old Testament. Isaiah leads the way because ‘Isaiah is so bold as to say, “I have been found by those who did not seek me; I have shown myself to those who did not ask for me”’ (Rom. 10:20; Isa. 65:1-2). But ethnic Israel has not been abandoned or forgotten even though the boundaries between Jews and Gentiles are beginning to blur. Whether we hear Paul say, ‘and in this way (kai houtōs) all Israel will be saved’ along an axis of means (Rom. 11:26),88 or ‘so shall all Israel be saved’ along an axis of time (Rom. 11:26), he speaks of the fullness (plērōma) of the one Israel of Jews and Gentiles (Rom. 11:25; cf. 2:28-29). When we hear Isaiah and Paul in concert, gathering in general and gathering outcasts in particular are God’s way (Isa. 56.8; cf. Rom. 10:15; Isa. 52:7), not some version of divinely calibrated exclusion. The Jewish part in the New Testament is undergoing a complete re-think and revision as we speak: in Krister Stendahl’s, Paul among Jews and Gentiles; in the New Perspective on Paul by E. P. Sanders and James Dunn, and finally, by belated attention to Martin Luther’s cruel vitriol against the Jews in his book On the Jews and Their Lies (1543). Let us read the text in Revelation again, “from every tribe of the people of Israel” (7:4). This time we shall read it in the aftermath of the Holocaust. We shall imagine the trains going to the extermination camps in Poland “from every tribe of the people of Israel.” We shall see the hair and the shoes and the combs and the purses of the deceased, “from every tribe of the people of Israel.” As we meditate on the 144,000, we shall not forget the 233,000. I mean the 233,000 Jews that used to live in Lodz in the western part of Poland at the outbreak of World War II; I mean that 233,000 are more than 12,000 times twelve. When the Nazi occupation of Poland had taken hold, it became a goal to make the new territory Judenrein. It was not easy, given that more than three million of Europe’s Jews lived in Poland. The Jews of Lodz were mostly taken to Chelmno, the first of six camps devoted exclusively to extermination. You may not have heard of Chelmno or what happened there — I plan to say more on the subject in a project that has the working title, The Bible and the Bodies in the Basement. But you can get an idea by watching Claude Lanzmann’s Shoah documentary of the survivor Simon Srebnik, when he returns to Chelmno. God willing, I will go to Lodz in April this year. Lodz, the city of 233,000 Jews, is the place where Chaim Rumkowski, the leader of the Jewish community, in 1942 gave his “Give me your children speech.” Google will help you find it, and I will help you, too, if I am able to bring my next projects to completion. After Lodz, I will travel the sixty kilometers to Chelmno. In Chelmno, I shall see the site where the mansion stood. The basement of the mansion was the place where the Jews of Lodz were kept in transit for one night before being gassed in the “gas vans.” The gas used was carbon monoxide from the van’s exhaust fumes. It took about ten minutes to kill the people inside the cargo space of the van, fifty people at a time in the small van, seventy at a time in the large one. Then the bodies were driven to a clearing in the forest five kilometers away, to be dumped into mass graves dug by Jews. I have more to say about the mass graves, but I cannot say it now. In that clearing in the forest, God willing, I shall on April 11 come for a season of grief and existential clarity. I shall bring a snippet from my favorite book in the Bible, and I shall read aloud the following verses. from the tribe of Benjamin twelve thousand sealed (7:5-8). I had not planned to share this with anyone. Indeed, I had not planned to write these comments on Revelation. But so it goes. The foregoing is not rhetoric. My plan has been months and years in the making. Surely, the God who notices the sparrow fall did not miss out on what happened to the 233,000. The God who knows how to count to 144,000 will also know the other numbers that should be memorized and remembered. If you wish, you can send me a note, and I will leave a sunflower (preferred) or some other flower from you — a person who aspires to be one of the 144,000 — as a tribute to that other group, the 233,000 buried in the forest in Chelmno. (The total was 400,000, but I have only counted the victims from Lodz). It will cost you nothing; I will pay for the flower. In Holocaust-hindsight, hardly any text in the Bible soars more than this one. And there is more. every tear from their eyes (7:17). Here, the “one hundred and forty-four thousand” are represented solely from the point of view of need. It would not be necessary to mention hunger, thirst, or exposure if these were not features of existence with which they are acquainted. There would be no need for a shepherd except for vulnerability and danger; no need for access to water except for scarcity and thirst; and no need to have tears wiped away except for the fact that they have experienced loss and grief. How can we relate to this, thinking mostly of North America and affluent parts of the world? We can talk about it in our after-dinner conversations, after the roast and the dessert, and we can imagine that this is a vision of future trials for which we should prepare. In the meantime, we can think of the thirst experienced during the transports to Auschwitz, of the hunger felt in the camps, of the scorching heat, and of the lack of protection. God has been on the side of the sufferer in the trials of life — this much is certain. God will make it up to them. I am saying this because the “one hundred and forty-four thousand” are represented as members of “the tribes of Israel.” We need to travel on from where we stand to capture the meaning of this, beyond the nasty anti-Semitic tradition in Christianity that began with John Chrysostom in the fourth century; we even need to distance ourselves from the Protestant tradition and from Luther, in particular. For the precise identity of the “one hundred and forty-four thousand,” I shall plead ignorance except to say that their identity is not a foregone conclusion. While John is watching, a participant turns to him, saying, “These who are dressed in white robes, who are they, and from where have they come?” (7:13). Why would a being in heaven ask this question of John on earth? The reason cannot be that the elder in heaven — and all of this is happening in the presence of the heavenly council — does not know the answer. These beings are in-the-know (they even know, qualitatively, the content of the scroll). And I said to him, “My master, you are the one who knows.” Then he said to me, “These are the ones who have come out of the great tribulation; they have washed their clothes and made them white in the blood of the Lamb. For this reason, they are before the throne of God, and they worship him day and night within his temple, and the one who is sitting upon the throne will shelter them” (7:14-15). I see in these images a vision of cleansing and commitment, the commitment made manifest in sharing the experience of the Lamb: “these follow the Lamb wherever he goes” (14:4). When R. H. Charles described the meaning of the seal of the living God, he made the seal the expression of an inward reality, not the other way around. In its deepest sense this sealing means the outward manifestation of character. The hidden goodness of God’s servants is at last blazoned outwardly, and the divine name that was written in secret by God’s Spirit on their hearts is now engraved openly on their brows by the very signet ring of the living God. In the reign of the Antichrist goodness and evil, righteousness and sin, come into their fullest manifestation and antagonism. Character ultimately enters on the stage of finality. It is not my purpose to dislodge anyone from his or her conviction that these are scenes of a reality still future. Or that the “one hundred and forty-four thousand” is a symbolic number that will be constituted mostly by people with whom we go to church every week. But I am grateful to Spectrum for the opportunity to say a word about a number less well known, the 233,000 Jews of Lodz, most of whom perished at Chelmno. 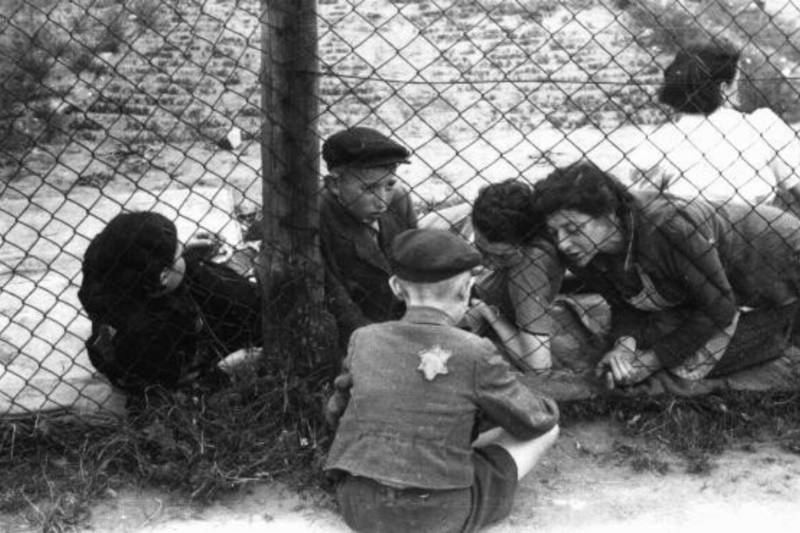 Image: Family members say goodbye to a child through a fence at the ghetto's central prison where children, the sick, and the elderly were held before deportation to Chelmno during the "Gehsperre" action. Lodz, Poland, September 1942. Photo courtesy of the United States Holocaust Memorial Museum.